Great article in the WSJ on Arnold Schwarzenegger. In the article he talks about his various some of his best and worst investments. It’s worth sharing. Schwarzenegger was a big influence on my life growing up. His story is unbelievable. He came from nothing. Really nothing. He had dreams, vision, and a plan. 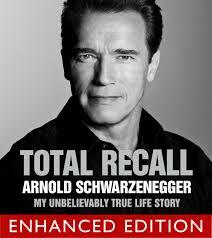 For those not too familiar with his body of work and accomplishments, I highly suggest you read his book, Total Recall. I wrote a review here. Below is the article from the WSJ. Arnold Scharzenegger has had one of the most impressive—and oddball—careers in popular culture, from two terms as governor of California to four (going on five) turns as sci-fi icon the Terminator. The financial bets he has placed have been just as diverse. Some have been high profile, like his ownership position in Planet Hollywood. Others have flown under the radar. In 1970, for instance, when he was a young Austrian expat with enormous biceps, he read that an airport for supersonic aircraft was being planned for the Mojave Desert. So, he spent $15,000 on 10 acres of land that had neither clean water nor electricity. But soon after he bought the land, supersonic flight was banned over the U.S., and the airport never materialized. Recently, though, those 10 acres of barren land—which he still owns—have risen in value as a nearby town has developed. The last appraisal came in close to $1 million, he says. Still, Mr. Schwarzenegger says his best and worst bets have had less to do with writing checks and more to do with investing his time and effort in getting ahead—as well as having a clear vision of what he wanted to achieve and preparing for a job. By the time Mr. Schwarzenegger was 15, his mom charged him rent to live at home. After seeing videos of the U.S.—“the Golden Gate Bridge, Empire State Building, the huge highways, the big Cadillacs with the big wings in the back”—he didn’t just want to leave his parents’ house, he wanted to leave his home country, Austria. Mr. Schwarzenegger decided that his ticket to America would be through bodybuilding. He began to train. He joined the Austrian army and continued training, his sights always set on moving to America. After he won the Mr. Universe competition in 1967—at 20, the youngest champion—he got an invitation from Joe Weider, one of the godfathers of the sport, to train in the U.S. THE TAKEAWAY: Mr. Schwarzenegger says he made it to America because he had a vision. From the time he was a teenager, he could visualize himself onstage winning Mr. Universe and using his success as an entrée to a life in America. As he diversified his professional goals—whether it was being an investor or governor—Mr. Schwarzenegger says he employed the same principle. It is one the things he tries to instill in young people today. As a child, Mr. Schwarzenegger looked up to men like Steve Reeves and Reg Park, bodybuilders who parlayed their muscles into film roles like “Hercules Unchained” and “Hercules and the Captive Women,” respectively. So, when Mr. Weider called him in 1969 and asked him if he wanted to go for the title role in the film “Hercules in New York,” he went for it. Mr. Schwarzenegger hardly spoke English, so Mr. Weider instructed him not to talk during the meeting with the producer. (Mr. Weider told him Mr. Schwarzenegger was “a German Shakespearean actor.”) Mr. Schwarzenegger got the job but had to talk to make the film. It didn’t go well. The performance was so bad that his lines had to be overdubbed. His phone stopped ringing. “It really took me back with my career of becoming an actor for several years because I didn’t get an offer or anything,” Mr. Schwarzenegger says. Mr. Schwarzenegger says he got so caught up in his initial success as a bodybuilder that he didn’t slow down and take care of the basics before he capitalized on opportunities. But he doesn’t think of the experience as a total loss. Looking back, it taught him an important lesson. Mr. Kornelis is a writer in Seattle. Email him at reports@wsj.com. What Google Learned From Its Quest to Build the Perfect Team is very interesting article from then NYT Magazine. This is a long-from article that can take some time to read but is worth it. As the title suggest, the article looks into what makes a team better or worse. The conventional wisdom of assembling your brightest most talented people together doesn’t necessary translate into higher results. We have some countless of examples, like in professional sport, where a team full of superstars can’t get the job done. With the right elements, a team of average talent can have superior results. How does a team work? Were the best teams made up of people with similar interests? Or did it matter more whether everyone was motivated by the same kinds of rewards? How often did teammates socialize outside the office? Did they have the same hobbies? Were their educational backgrounds similar? Was it better for all teammates to be outgoing or for all of them to be shy? The article digs into that. This is a very long article, so I’m going to summarize parts of it. Below are cut and past of different segments of the article. *Updated Friday January 29, 2015 with more info. That’s it. It’s over between me and coffee. Me and coffee have officially been broken up for almost a full month. I’ve been faithful by not messing around with any other source of caffeine (and no decaf, it’s weird and still considered cheating in my book). I have been juggling with the idea of quitting coffee for a couple months and that now my baby is finally doing her nights, it definitely help make the hard decision. So I was “using” coffee to get through. Why do such a cruel thing to myself? I did it for me. I wanted more energy. I also don’t like the idea of being “addicted” to anything. The motivation also came from a friend of mine, a more intense coffee drinker than me I just should note, who has quit coffee and as a result claims he has way more energy than when he was on coffee. I heard that from other folks as well. I had to test it myself. I should give you a little background on my coffee habit. I’ve been a daily drinker for 9 years (same amount of time that I’ve been with my spouse). I average two cups a day, occasionally three. One or two in the morning and one after lunch. I’m also not one of these grumpy people in the morning because they didn’t have their cup of coffee. I love my coffee. I like waking up the morning and making it. It’s almost like a little ritual and there’s pleasure in doing it. Those who visit my blog probably read a couple posts on coffee. They have been among my most popular posts. I think people visit the blog more for the coffee posts and than the investment stuff. I’m one of those coffee “amateur”. I have a few coffee/espresso machines, grind my own beans, shop for organic beans etc… I’m that coffee guy. As many coffee lovers know, the idea of quitting coffee can be torturing. The verdict: It has been 28 days and I feel awesome. The first benefit I noticed is the quality of my sleep. Now I have these very long colorful dreams. it feels like the dream never stops. It’s definitely sign that I’m sleeping more deeply. The first week is the roughest but it gradually gets better. The first three days I didn’t notice anything different. Then I think on the fourth day that’s when my body realized that the good stuff wasn’t coming in anymore. I got hit by random fatigue attack. My thinking was at times blurry and I suffered from the lack of concentration. So my start to 2016 wasn’t the most productive. If you Google a list of symptoms, I had about half of them. And fortunately I didn’t get any headaches, and that’s a big one and a deal breaker for a lot people. Four weeks in I can testify that I have more energy than before and it’s going to get marginally better. We know that non-coffee drinker don’t need coffee to have energy. We drink coffee to get that “natural” energy level, whatever that might be, and not to be above. After a couple weeks the benefits outweigh the cost. Quitting coffee is an experiment that’s working well The break up was fine for the most part. There were a few instances where I really wanted a cup, like the time I had breakfast at a restaurant. It feels really weird not have a coffee when reading your newspaper. I could have ordered decaf so I could have the complete experience but I didn’t. Coffee and a newspaper. They go together so well. I’m not a smoker but when a smoker says they need a cigarette with their drink, I can sort of relate to that now. They call themselves social smokers. I haven’t banned coffee from my life. I plan on drinking the occasional cup sometime the future but I don’t plan on reintroducing coffee in my daily diet. I will treat coffee like alcohol, I will have it occasionally for pleasure purposes. Maybe on weekends or when I read the newspaper. I guess you can call me a “social” coffee drinker. To Get One’s Goat means to aggrevate. 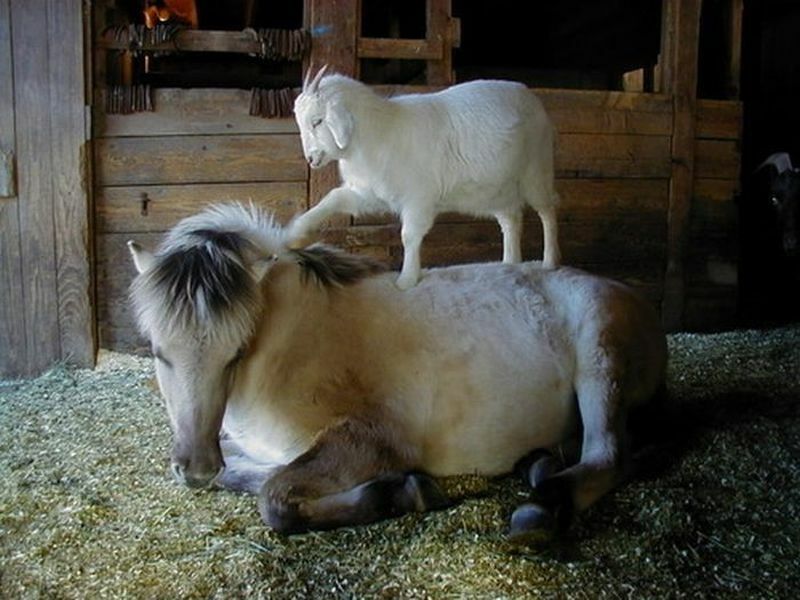 Origin: Hyperactive racehorses were often given goats as stablemates because their presence tended to have a calming effect on the horses. After the horse became attached to the goat, it got very upset when its companion disappeared, making it run poorly on the track. In the 19th century, when a devious gambler wanted a horse to lose, he would get the horse’s goat and take it away the night before the race, thus agitating the horse. With the Belmont Stakes coming up this weekend, you want to make sure that there’s no gambler trying to take your horse’s goat. To win hands down means to win by an enormous margin. Origins: If a racehorse jockey is so far ahead of the competition that there is no danger he will be passed again, he can drop the reins and his hands and let the horse finish the race without spurring it on. With the Belmont Stakes coming up this weekend, this is what you wish from your horse. Mike Ozanian from Forbes did a great interview with Robert Kraft, the owner of the New England Patriots.This is same Robert Kraft that got one of his Super Bowl ring stolen by Vladimir Putin. This 50 minute interview is a refreshing from all 1 minute rapid fire sounds bite that’s flooding the Internet. Why is it that in the world of non-stop 24-hour we can’t have a decent interview? I guess that’s the topic a future blog post. Regarding the interview, Robert Kraft goes in-depth on not just the Patriots, but also his philosophy, faith, how he acquired the team, what you need to be successful, what drives him and more. He’s not just any NFL owner, since he acquired the team the Patriots won 4 Superbowl on six appearances, that basically qualifies for a modern day dynasty in the salary cap era. Nice job by Mike and team Forbes for scoring this interview. 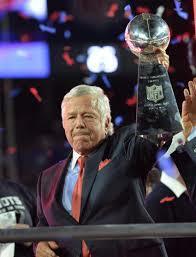 In 1994 Kraft bought the team for $172 million, about $50 million more than he told his wife he was willing to spend. He told his wife that a reasonable price for the franchise was $115 million but was willing to go as high as $125 million. With that purchase, it was the highest price ever paid for a sports team at that time. Then afterward he built Gillette Stadium, recruited Bill Belichick, drafted Tom Brady and the rest is history. Today the New England Patriots are worth $2.6 billion, or a nice return on your investment. At the moment the video has less than 2,000 views. That mesmerize me. I know the local chamber of commerce charge upward of $250 per person to bring guess speakers in and they sell out. Youtube has millions of hours of video like this one for free that will educate you and make you a better person, sort of a e-library. 2,000 views…..that’s insulting. In the other hands, Justin Bieber probably just broke the Internet with his latest music video. We’re definitely heading in the right direction.